Austin, Texas. Once again, the crowds were too big, the traffic was too crazy, and the hype is getting way too obnoxious. Yet here I was again back in Austin for another South by Southwest music festival. And here I was again enjoying some of my favorite bands and having a great time — despite the crowds, the traffic, the unrelenting hype. I was there without actual festival credentials. (I don’t need no steenking badges!) So I didn’t go to very many “official” festival showcases. But, as veteran attendees know, there are more than enough unofficial shows to make up for that. Here are some of the better ones I saw. 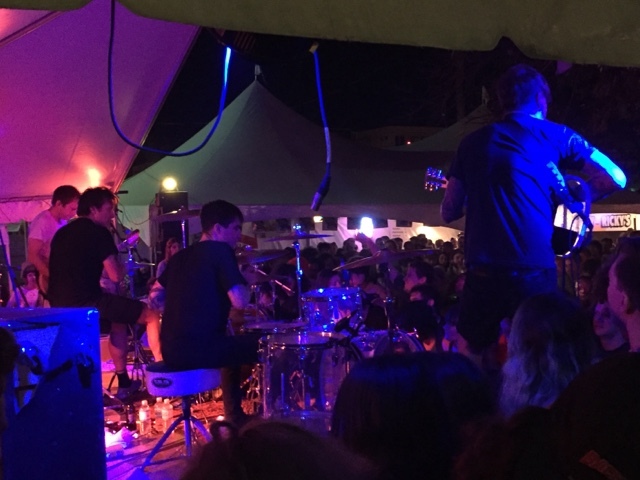 * Thee Oh Sees at Hotel Vegas. This is the third time I’ve seen John Dwyer and his merry band. But neither of the first two shows I saw was half as fierce, aggressive, or intense as the one I saw this year. They started off on full-blast warp speed and rarely eased up for the hour-plus they played. 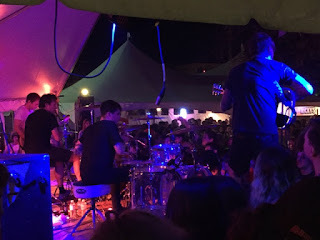 The latest version of Thee Oh Sees has two drummers, a bass player and, of course, leader John Dwyer on guitar, vocals, and occasional keyboards. The crowd was well-past fired up, immediately forming a frenzied mosh pit, which inspired a seemingly endless stream of stage divers/crowd surfers. It was as if the early’90s never ended. And yes, that can be off-putting to us older fans who don’t want to lose our dentures to some idiot slam dancer. Dwyer’s crazed otherworldly musical vision — the distorted falsetto vocals, the crazy sci-fi guitar bleeps and bloops — cuts to the bone. * The Hickoids at The White Horse. 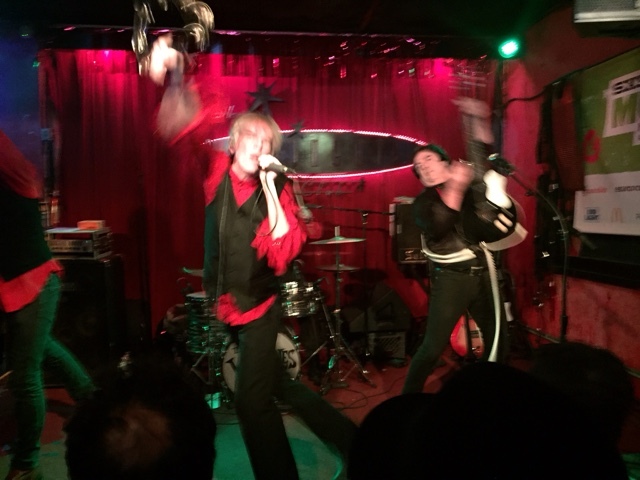 This long-running Texas cow-punk goofball group has become one of my chief must-see bands every time I go to Austin. Having a Santa Fe crony, guitarist Tom Trusnovic, in the group helps, but I was already a casual Hickhead even before he joined several years ago. 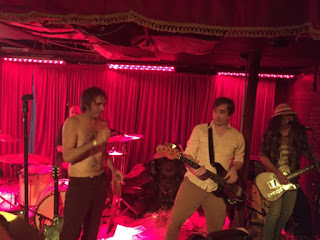 I was a little apprehensive about seeing the group this time because it would be the first Hickoids performance I would have seen since the death of original member, guitar slinger and cosmic cowboy Davy Jones. Earlier that evening, before The White Horse show, Jones was honored at the Austin Music Awards. 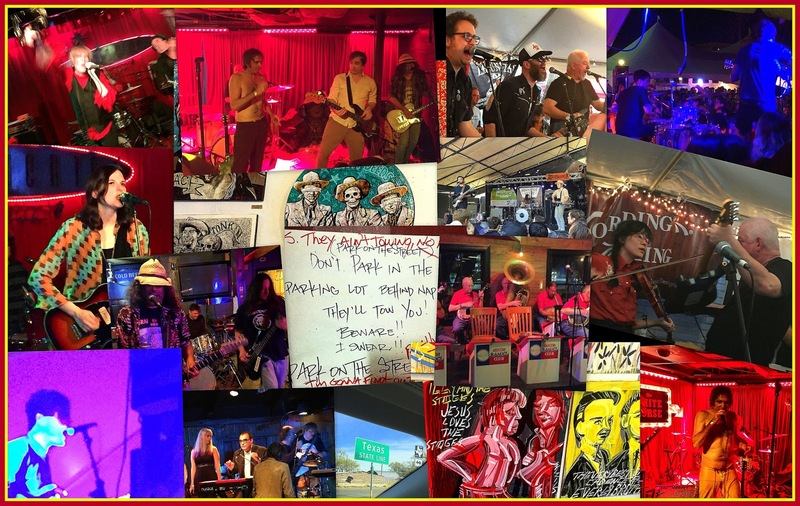 Two years after The Hickoids were inducted into the Austin Music Hall of Fame, Jones was inducted as a “solo” artist. Head Hickoid honcho, Jeff Smith, was there to accept that award. He held it up onstage at The White Horse before the band started playing. 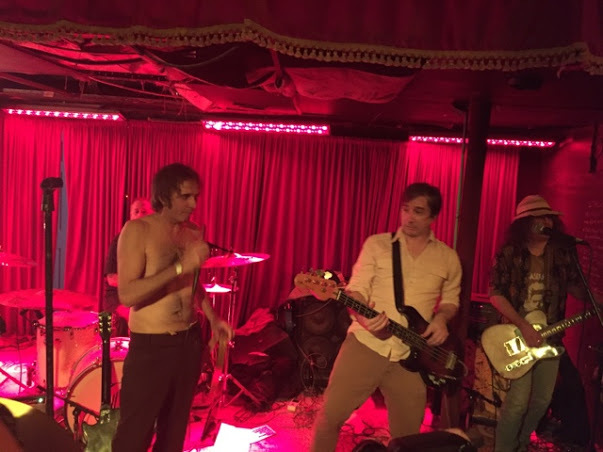 Then the surviving Hickoids proceeded to live up to Jones’ memory, bashing through some of their greatest hits including “Git Back on the Truck,” “Cool Arrow,” “Working Man’s Friend” and the fabulously filthy “Stop It! You’re Killing Me.” By the end, we were all screaming for more. Davy would have been proud. And the next night, I caught Trusnovic playing at The 04 Lounge with the latest version of his garage/punk group Monkeyshines, which he started years ago in Santa Fe. Monkeyshines still has that wild joyful noise. Records party has been a SXSW highlight for 20 years now. You always know it will be a fun show. 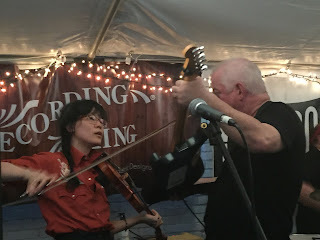 But this year, Jon Langford, Dean Schlabowske, Tracey Dear, and the others seemed supercharged. The old songs — “See Willie Fly By,” “Plenty Tuff and Union Made,” “Do You Think about Me” — sounded more vital than that they have in years, and their new tunes from their recently released Going Down in History were all punches that landed. * Timmy Thomas at Saxon Pub. Thomas is a Miami-based soul singer who had a hit in 1973 called “Why Can’t We Live Together.” That was his biggest success, though Thomas kept recording for another decade or so, routinely hitting the R & B charts. He basically dropped out of sight for a few decades. But then last year Drake sampled a little bit of “Why Can’t We Live Together” and that seemed to give Thomas a late-career second wind. Playing with a band complete with a couple of sax players, Thomas, whose vocals remind me a little bit of Swamp Dog, performed a funky set including old hits and material from an upcoming comeback record. * Eve & The Exiles at The Continental Club. 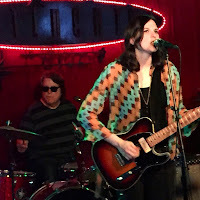 Eve Monsees, a local Austin favorite, is one amazing guitarist. 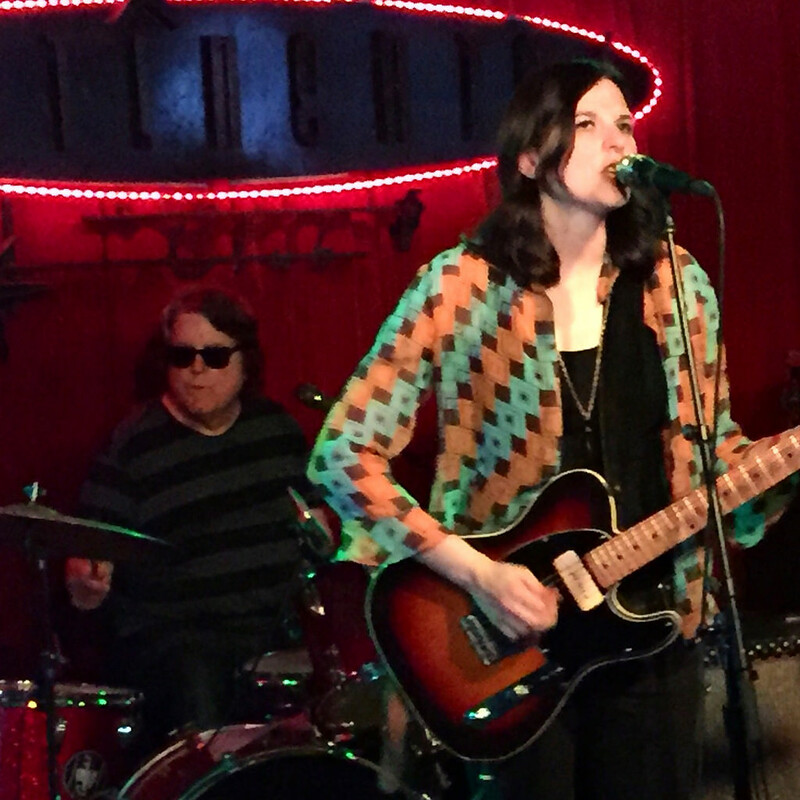 She’s a longtime friend and former schoolmate of bluesman Gary Clark Jr.’s and a co-owner of Antone’s Record Shop. She’s been playing since she was a kid, and the fact that she loves it is obvious in every note she plays. The first time I saw her was a couple of years ago when she was performing with The Bluebonnets, ex-Go-Go Kathy Valentine’s group. On Wednesday she was fronting her own band, The Exiles, at a Continental Club event called Garage Fest Day Party. It’s a simple guitar/guitar/bass/drums quartet with Eve handling nearly all the vocals. Together they make a tasty bluesy, garagey, early Stonesy stew. unrelenting, raw-rocking, soul-informed good-time sounds. They’ve been around since the early ’90s. They definitely look their age, and they seem a little uncomfortable in their little matching red-and-black uniforms. But all this only adds to their crazy charm. They’ve got more energy than a hundred horny teenagers, and singer Mighty Manfred takes the role of a hyped up master of ceremonies of a party that might just last forever. Manfred announced that “Karate Monkey,” a Chubby Checker song The Woggles cover, is the best dance song in the world. I was skeptical at first. 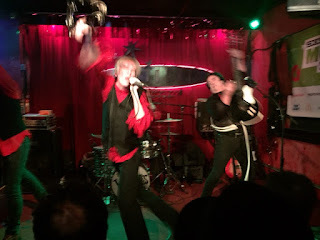 And then, The Woggles removed all doubt. * Night Beats at The Mohawk. This Seattle-based psychedelic trio, which has roots in Texas, was playing all over Austin during South by Southwest, but I didn’t catch the group until late Saturday afternoon, near the end of the festival. They looked exhausted, but they managed to play an energetic set. Like many of the first-wave acid-rock groups, Night Beats fuse spacey guitar with hopped-up soul riffs. While their instrumentals hint at mind-expanding excursions, unlike your typical “jam bands,” they tend to keep their songs nice and short. The group has a new album, Who Sold My Generation, which I just ordered. Stay tuned. Here are Thee Oh Sees, same place I saw them but I think a couple of nights later. I wasn't at this show, Saturday night. 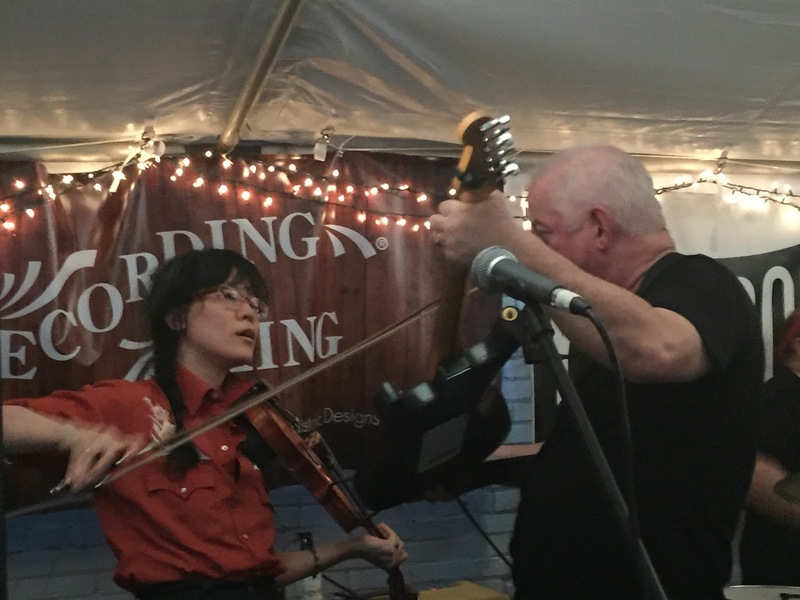 But allegedly this performance got Jon Langford, playing with one of his bands, Bad Luck Jonathan, kicked out of The Saxon Pub. He's quite a lovely dancer.